Apologies for the delay in releasing this next article, but I’ve been on tour (as has my interview subject), and on the road, time and stable WiFi don’t always align. For this edition in my blog series feature Behind the Art, I was especially intrigued to interview Michelle because her career is the one I had my eyes on as a teenager. Straight out of high school I really wanted to be a sound engineer, but my dad said, “No daughter of mine is going to work in the music industry.” Look at me now. FOH Engineer* & co-founder of SoundGirls.org. Follow Michelle online. What prompted you to pursue sound engineering? How did you happen into it? I’ve had a passion for music from a very young age. Whenever I wasn’t in school or sleeping I had the radio or records on. Good music always moved me and it was also a great escape. I started playing piano somewhere around 6 years old and took lessons all through high school but never really wanted to be a musician since I was very shy and didn’t like attention or the thought of being in the spotlight. I also had a very keen interest in science and how things worked. So when I was in junior high and it was time to decide what I wanted to do with my life, something just clicked and I decided I wanted to be a recording engineer and make records. That would allow me to still be part of the creative process of making great music but not have to be a performer and it would also feed my technical side. Are you predominantly a live show mixer or do you also engineer projects in the studio? I only do live sound. Who all is on your list of credits? I’m currently working for Mr Big, who I have been with since 2009. My other credits include Goo Goo Dolls, Styx, Melissa Etheridge, Big Time Rush, Adam Lambert, Ke$ha, Natasha Bedingfield, Tokio Hotel, Gwen Stefani, Christina Aquilera, Jewel, Indigo Girls, Collective Soul, Fuel, Thievery Corporation, Debelah Morgan, Luscious Jackson, Fastball, Joan Osborne, General Public, Spin Doctors. 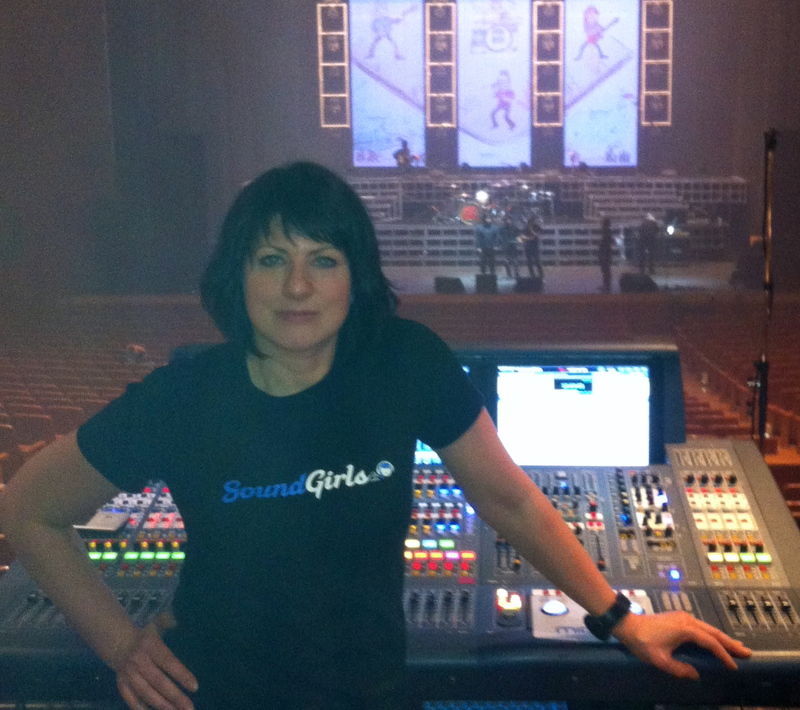 I am also co-founder of SoundGirls.Org, whose mission is to provide a place for women working in audio to connect, network, and support each other, while also empowering and inspiring the next generation of women in audio. I went to two different technical schools. First, the Recording Workshop in Chillicothe, OH. They had a 3 or 4 week program in basic recording engineering with an optional week of studio maintenance. After I completed the course, I worked at a radio station for a brief time and then went to Nashville to try and get a job at a studio. I realized I still had a lot to learn if I was ever going to break into this business. I attended Full Sail in Winter Park, FL which had a nine month comprehensive program covering everything from Recording Engineering to Live Sound, Video, Music Business, Midi (which was fairly new at the time), etc… From both schools I got a great background in theory and the principles of audio but I learned how to mix by doing it. Immediately after attending Full Sail I interned at a local sound company where I worked in the shop during the day and did shows on the weekends. From there I worked at a few night clubs and in the AV department of Church St. Station which was a big entertainment complex in downtown Orlando. I mixed in a couple of the clubs there and also mixed local bands, worked as a stage hand, basically did whatever I could to keep working and learning. My first tour with a national recording artist was the Spin Doctors in 1992. A friend of mine was mixing the Spin Doctors when they were still relatively unknown. He wanted to get off the road and was looking for someone to take over for him. He knew how hard I worked and how bad I wanted to get on the road so he called and offered me the job. They were coming through my area in a few days so the plan was for me to go out and meet everyone get on the bus and do the next several gigs. If they liked me I would stay and if they didn’t, they would be back in my area in two weeks and I would get off the bus and go home. It worked out and they liked me. One month later their album had landed in Billboards top 100 albums and kept climbing up the charts. It was perfect timing. Probably when on one of my early tours, I was mixing the Spin Doctors and we opened for the Rolling Stones on their Voodoo Lounge tour. I had only been touring for about two years at that point and we were playing NFL stadiums all over America and huge soccer stadiums in South America. But we were on tour with the Rolling Stones and that was pretty amazing for a small-town girl. I honestly don’t research many artists unless I am going to be working with them. Then it’s to learn their music, their influences, the type of gear they use, etc., so I can get an idea of what they are looking for. I live in Scranton, PA. Mostly because when my husband and I got together that is where he was from. Being a touring engineer, I can be based anywhere as long as I have an airport nearby. What is your daily routine on tour? Wake up on the bus, go to catering, if I have time – take a shower, load in and set up FOH. Tune the PA and once everything is mic’d and the backline crew is ready, we do a line check, grabbing lunch somewhere before or after. Wait for sound check. After sound check there’s usually a bit of free time until the show. That’s when I catch up on any work and/or emails, phone calls, nap. Then, mix the show and load out. Take a shower and get on the bus. Do it all over again the next day. Every day is a productive day. The show must go on as they say, so it doesn’t matter how screwed up things are or how difficult the gig is, we have to make it happen every day. There’s no putting it off until tomorrow because you’re just not feeling it. Or just grabbing your coat and going home at 5 PM. The days are long, sometimes 16 hours and you get the job done, every single day. Of course, on tour you’re at different venues each night, but is there anything unique about your workspace? What do you keep on the console? What’s the view from your workspace? If we are carrying production (sound/lights, etc.) and I have the same gear every day then I tend to make it a little more fun. We had a couple Godzillas at FoH on my summer tour, and a little disco ball hanging from the console. A few years ago, I found a great shag carpet and a mini lava lamp, add a few comfy camping chairs and we had a cozy little space. I don’t know if you’d call it a habit, but whenever I check into a hotel room I end up dumping out the entire contents of my suitcase and re-packing. I’ll have stuff spread out all over the place, it looks like someone came in and ransacked my room while I was in the shower. But it helps me to settle in and keep things organized. Deep Purple: Lazy. I love the groove. Tori Amos: Northern Lad. So much emotion in her voice. Wake Me Up: Avicii. My guilty pleasure, it just makes me move and makes me happy. Richard Bach: Illusions, great book. I read it in high school and many times since. It has always been one of my favorites. It’s a very unique way of looking at life. Carl Sagan: Pale Blue Dot. Beautifully written, it really puts a perspective on our place in the universe. Anything by Taylor Caldwell. She has a way of painting a picture that puts you right into the heart of the story. My husband inspires me. He’s a touring production manager, and we met on tour with the Spin Doctors. He has an amazing work ethic and attitude. He’s great at his job and always upbeat and positive and keeps me grounded. I started playing piano when I was very young and took lessons all through high school. Are you and your husband on the same tours? If so, how often? When we first met we were both on tour with Spin Doctors. We instantly became best friends and a year later became a couple. We managed to work together every other year for a long time, but have not worked together since 2008. Luckily our schedules over the past few years have allowed us to spend some quality time off at home together, but we’ve also had to go for long periods of time without seeing each other for even a single day. That gets old. Also, if so, how is working on a tour with your husband? How do you make it work? Working with my husband is great. He is the best production manager I know and amazing at his job. He is currently Production Manager for Trans Siberian Orchestra (east). When we aren’t working together we just do our best to see each other when we can, whether flying home or out to each other’s gigs for a day or two whenever we can. We try and talk every day, even if it’s just briefly. Skype has been a great tool for keeping in touch. It’s not easy and you really have to work at it. But the fact that we both tour makes it a little easier, since we understand the job and road life. My mother always told me, “Never sit in a wheel chair or you’ll end up in one.” To this day, I can’t sit down in a wheel chair, even if it’s the only seat around and my feet are killing me! Ha ha, you could say that about my superstition! Do you have a funny story related to your job? Years ago I was on tour with Indigo Girls during the summer, the crew had acquired a bunch of fireworks for the 4th of July and we were setting them off in the parking lot after the shows for about a week. We were down to the last little stash of them and were driving from Vegas to L.A. Everyone had been drinking in Vegas and at one point I think all ten of us were hanging out in the back lounge of the tour bus. People started to go to bed and it was just the production manager, me, my system tech, and the guitar tech left in the lounge. The PM [production manager] started lighting firecrackers and tossing them out the window as we were driving down the highway. I decided to go to bed and wasn’t even completely in my bunk when I heard “pop, pop, pop, pop, pop….” coming from the back lounge. It must have lasted for five minutes and everyone came out of their bunks. Finally one of the crew opened the door to the back lounge and tons of sulphur smelling smoke came pouring out. The PM had lit the end of a brick of black cat firecrackers and tossed it out the window but it had blown back in and landed on his lap. He threw it into the air and dove into a corner along with the other two crew guys who were still there, while the entire brick went off in the back lounge. There was so much smoke and paper falling from the ceiling, it looked like a bomb went off. We cleaned it up and apologized to the bus driver because there were burn marks in the cushions that we couldn’t get out. He laughed so hard at what had happened, he told us not to worry about it. We still laugh about it ten years later. I’ve been doing load ins and load outs since I was about 8 years old. My mother and grandmother had an arts and crafts business when I was a kid and we used to go all over the area doing craft shows. My brother and I would be in tow and helping load up the car, set up, tear down, over and over again. So in a way it kind of prepared me for my life on the road and taught me how to pack a truck. Practice, practice, practice and play as much as you can. Be open to any and all opportunities that present themselves to you for playing music. You never know who is going to see or hear you play. Every contact and connection you make will lead to more contacts and one of those may be the key to your success. What advice would you give to someone interested in becoming a sound engineer? There are many different ways into the business, you’ve got to find what works for you and you’re going to have to knock on a lot of doors before you get anywhere so you must learn persistence. Seek out a local band or sound engineer that will take you under their wing and show you the ropes. Try getting a job at a sound company and work every show you can, learn as much as you can from everyone around you. If you’ve got no idea where to start, get an education in audio engineering to learn the theory and principles of sound. Train your ears and take care of them. The SoundGirls.Org website has a lot of great resources for getting started in audio. There is also a wonderful community of women working in audio and music production who can offer tons of support and advice. Whatever your desire is, whether to be a musician or get into audio or music production, if you truly have a passion for it and work hard you will eventually get to where you want to be. But don’t be afraid to change your path along the way; the road may not always take you where it is you think you wanted to go, but it just might take you somewhere better. Thanks, Tom. Glad you dropped by for a read.